Dream it, Build it, Live the Dream! Fulfilling your desire to have your dream home is our passion at Bear’s Den Log Homes. We are a log cabin home provider committed to serving our customers in the utmost regard before, during, and after the building process is complete. Specializing in unique, hand-crafted custom homes, we passionately strive to provide the highest quality products along with superior service to our Log Home, Timber Frame, Hybrid and Craftsman Style Home enthusiast customers every single day. As you browse through our website filled with beautiful North Carolina log and custom homes, you may find yourself bitten by the “Bug” and it can be very exciting. While traveling to the mountains of western North Carolina to find the perfect location for our wedding, we stumbled upon a breath-taking log home in the mountains and knew that this was the place. After only one morning on the deck while sitting in our rocking chairs and sipping hot coffee, we both knew that this tranquil lifestyle had to somehow find its way into our lives. During our journey, we saw many North Carolina log cabins. They were nestled in the woods, setting by a tranquil lake, and even hanging off a mountain side, but these were just images we had seen and not experienced until now. As the years passed every table in our home gradually filled with stacks of log home magazines. It was at this point that we knew that it was time to fulfill our dream. So in the fall of 2006 we picked up and moved to the foothills of western North Carolina. After researching many log home companies and attending many log home shows and events, one particular manufacturer had seemed to make its way to the top of the list: Honest Abe Log Homes. We decided to become dealers ourselves and help others fulfill the dream of log home ownership. With 2 children and 5 grandchildren between us, we opened Bear’s Den Log Homes and began our new journey. Darlene’s 25 years in the building industry and Rodger’s 30+ years in the financial management industry together created the perfect team. We offer a “Help Build” program including services for locating property (if you have not already done so), obtaining financing, selecting a building style and materials, custom designing your home, and selecting a contractor. We work with you right up to the day you receive the keys to your new home and beyond. Now, with 10 years as log and custom home dealers and having received the 2010 and 2014 Dealer of the Year Award from Honest Abe Log Homes, we understand that in-depth planning and communication are essential to client satisfaction. Specializing in high quality, custom new construction, we offer each client an exceptional level of personal service, support and expertise. Our fundamental goal is to make the building process simple, manageable, straight forward, and fun! Our mission now, is to help you and others “experience the experience” of log home living in your very own custom dream home. We also publish a monthly newsletter to keep you informed and up to date on changes in the building industry, follow the construction process of custom homes we are building, offer links to helpful sites, and we always add fun photos from our personal lives along with a favorite recipe. You can sign up for our monthly newsletter HERE. Please feel free to contact us by phone or email when you are ready to start your journey. In our quest for selecting a log home manufacturer, a lot of research was performed and that research led us to Honest Abe Log Homes. 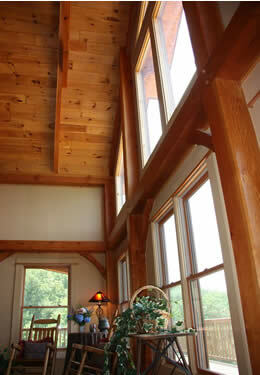 We know that building a log home is not a decision made on a whim. It takes a lot of thought and careful planning. Over the years, the name Honest Abe has come to symbolize the finest of American traditions: straight talk, integrity and the convictions to back up every claim. At Honest Abe Log Homes, we don’t take our name lightly. From the beginning, honesty has been the core of our philosophy. There are hundreds of log home companies that you can choose from, but only a very small percentage are members of the Log Home Council. Honest Abe Log Homes is a proud member of the Log Homes Council. Established in 1977, the Log Homes Council is a national organization composed of leading log home manufacturers committed to promoting the unique benefits of log building systems. As part of both the Building Systems Council and the National Association of Home Builders, the Council upholds ethical business practices by participation in both mandatory and voluntary programs designed to benefit log home customers. 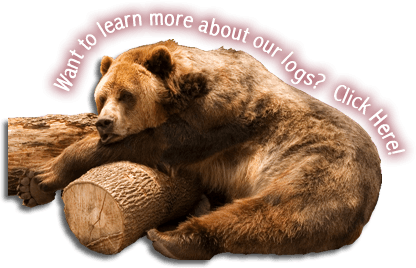 As a member of this well-respected organization, Bear’s Den Log Homes, along with Honest Abe, can offer customers peace of mind in building their new log homes. Honest Abe adheres to the Council’s log grading standards to assure safety and quality construction. In fact, the Council’s standards are accepted by both building officials and mortgage lenders which can streamline the customers’ planning and financing processes. 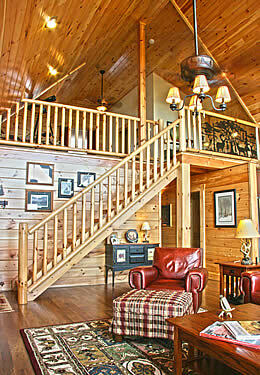 “Working with Bears Den Log Homes is a pleasure. Darlene is very knowledgeable and works with you at every step. Starting with the planning stage, and then drawing up plans, they work to assure you get the best deal for what you want for your log home. We chose the Clearbrook model and modified it – they worked closely with the builder, Honest Abe Log Homes and us making sure everything came together. Bears Den will go the extra mile throughout the building process and even after you have moved in to assure that everything is right. On many occasions, we found it necessary to contact them with questions or to acquire additional materials. The response was always immediate and the problem or request was taken care of in a timely manner. Not only are they knowledgeable about the planning stage but also very knowledgeable about the building process and helped us with difficult decisions.